We'll show you how to get a US IP address from outside America so you can access your favorite shows, content and apps (including Netflix) from anywhere. Better still, we'll show you a clever trick to get a top-rated VPN free for a month. The easiest and most efficient way to get a US IP address is by signing up for a suitable VPN provider. In this article, we’ll teach you how to get an American IP address to access content and services only available in the US. This method works for most popular devices including Mac and Windows desktop PCs, Android smartphones and tablets, iPhone and iPads, the Amazon Fire Stick and Fire TV, plus many more. Sign up for a Virtual Private network (VPN). We recommend ExpressVPN. If you just need access for a short time, for example for a trip abroad, you can access our top ranked VPN free of charge. If you sign up for ExpressVPN here, this link includes a 30 day money-back guarantee. You will need to pay for the subscription, however, you can use the VPN for up to 30 days and cancel for a full refund. It is a ‘no quibbles’ cancellation policy and we are yet to hear of this not being honored. Why get an American IP address? People might want to obtain a US IP address for several reasons. American residents traveling abroad can use it to watch geo-restricted streaming services like Netflix or Hulu. Netflix restricts its catalog depending on where you’ve logged in from, so it’s a good choice if you would like to obtain the full range of movies and TV shows. That’s similar to how HBO GO and Vudu operate, so a VPN is a good tool for those as well. Others might want to keep in touch with live sports such as Major League Baseball (MLB), National Basketball Association (NBA), or the National Football League (NFL) by streaming ESPN. With a US IP address, you can also access online banking and other services that block non-US users. What’s the best VPN to get a US IP address? ExpressVPN is an impeccable VPN service that’s easy to set up and comes with a simple design. The service packs a punch when rated on both speed and encryption standards. The US occupies the bulk of ExpressVPN’s server locations with options in 13 cities. Overall there are over 1,500 servers spread across the world. The company has a stated policy of not storing any user or traffic logs, so it scores high marks from a privacy angle too. The only minimal data it does extract is the “date (not time) of connection, choice of server location, and total bandwidth used”. This is used to improve service quality standards. It’s important to note that your individual IP address won’t be recorded. If you’re still feeling skittish, we recommend you sign up for the service via a burner email account and pay through Bitcoin. It’ll become extremely difficult for your digital footprint to be traced back to you. Encryption standards are military grade. The service leverages 256-bit AES-CBC protocols as well as HMAC authentication and perfect forward secrecy. An internet kill switch is included, which ExpressVPN refers to as a ‘network lock’. This feature means all web traffic will be temporarily halted if the connection drops. The service is able to unlock geo-restricted content on Netflix. It unblocks both Hulu and HBO Go as well. BEST VPN TO GET A US IP ADDRESS:ExpressVPN is our #1 Choice. A blazing fast and reliable choice. Great at unblocking all major geo-restricted streaming services. Top privacy features and keeps no logs. Try it risk-free with the 30-day money back guarantee. Here’s our in-depth ExpressVPN review. NordVPN is an excellent option for advanced users who want customized options coupled with tier-1 service. NordVPN allows you to select servers based on your specific requirements – such as anti-DDoS, video streaming, double VPN, Tor over VPN, or P2P. NordVPN operates more than 5,000 servers in total, and a large portion of those are in the US. NordVPN uses the 256-bit AES protocol encryption standard by default coupled with 2,048-bit SSL keys. DNS leak protection is enabled. It holds zero user data – this includes browsing habits, timestamps, and server information. There’s apps for Windows, MacOS, iOS, and Android. CyberGhost will appeal to beginner users who want a relatively inexpensive VPN without any frills. It delivers on both speed and security, as well as the ability to unblock streaming sites like Netflix and Amazon Prime Video. The company is headquartered in Romania, which means it’s not required to store any user information, so it keeps zero logs. You can choose your server by location or by what you want to do online, such as unblocking a streaming site or P2P filesharing. Encryption standards are among the best in the business. An internet kill switch is included. BEGINNERS' CHOICE:CyberGhost has a simple set up and is easy to use. Streams HD video reliably. Limited in use with some popular streaming sites. 45-day money back guarantee. Fast speeds and strong encryption are the pillars of IPVanish. It is completely logless, meaning it won’t ever store usage data of any nature. Encryption protocols are tough. The company leverages 256-bit encryption on the OpenVPN protocol by default, SHA512 authentication, and a DHE-RSA 2,048-bit key exchange with perfect forward secrecy. The latter feature means that even if an intrusive entity breaks into your account, it’ll be impossible for it to decrypt past session data. IPVanish includes an internet kill switch and leak protection. Servers deliver great speeds and are stable and secure. US server locations number in the hundreds, which make up the bulk over 1,000 servers across the globe. LARGE NETWORK:IPVanish can connect up to 10 devices and is great for families. Recommend for their high standard of privacy, but keep shopping if you want to unblock Netflix. 7-day money back guarantee. VyprVPN is a mature VPN provider that’s been around for over seven years. Privacy advocates love it because it’s one of the few that’s able to circumvent China’s Great Firewall. The company operates servers in eight US cities. Having said that, some users might be troubled by the fact that the company chooses to retain user data. Specifically, the data that’s stored is “the user’s source IP address, the VyprVPN IP address used by the user, connection start and stop time, and total number of bytes used.” But VyprVPN insists that it’s only kept for a period of 30 days and is used for troubleshooting. Traffic is secured by the OpenVPN protocol, 256-bit AES encryption, 2,048-bit RSA keys without perfect forward secrecy, and SHA256 authentication. VyprVPN also owns entire data centers and doesn’t rely on third-party operators at all. This helps it secure traffic. UNLIMITED DATA USAGE:VyprVPN is user friendly. Good speeds and uptime as all servers are owned by VyprVPN. Not the cheapest option. 30-day money-back guarantee. Free VPNs are heavily advertised on the internet and some users may be tempted to sign up. However, many such services have a poor track record of impinging on users’ rights by stealing their data and selling it to third-party advertisers. After all, even free VPNs are registered businesses. Hence they need to make money to pay for staff salaries, server maintenance, and general office overheads. That’s why the route for monetization becomes users themselves. Even if your data isn’t stolen, expect bandwidth throttling, weak encryption standards, and data caps. So it’s likely that you’ll be booted out if you stream Netflix for an hour or so. Tons of invasive advertisements are also common, with the real risk of contracting a malware infection. We recommend you avoid the random free VPNs on the web. If you’re trying to obtain a US IP address, it’s pivotal that your privacy and anonymity is secured at all times. The VPNs mentioned in this list don’t have a history of handing over user data but there are several other unscrupulous ones. We think you should turn your back on them. There’s evidence to suggest that VPN provider PureVPN collaborated with law enforcement agencies to help identify one of its users. PureVPN and the FBI joined forces after an unnamed 24-year-old woman filed a complaint about falling prey to an online blackmailing plot. She suspected her roommate, Ryan Lin, to be culpable. The FBI traced the activity back to PureVPN, who then used its logs to identify the culprit. Ryan was arrested. PureVPN insists that it didn’t record the content of communications, but it did have a ‘no-logs’ policy in place. There’s a real question mark on how ethical they might have behaved. Israel-based Hola, a popular VPN extension for Chrome, used its sizable user base of almost 50 million for illegal purposes. The company turned this critical mass into a massive botnet in 2015, leveraging individual user bandwidth to engage in Distributed Denial of Service Attacks and distributing copyrighted material. Users were completely in the dark. The popularity of free VPN service Hotspot Shield meant that it clearly was doing something right to win over users. Unfortunately, this service also seems to be one that went over to the dark side. Last month, a privacy advocacy group filed a complaint saying that Hotspot Shield forcefully inserted tracking cookies in user devices, mined the data, and sold it to advertisers for a profit. The complaint added that the company knowingly diverted ecommerce traffic to partner domains – thereby earning commissions on affiliate sales. The jury is still out on Hotspot Shield but we recommend you avoid using the service until and unless it’s able to prove its innocence without a shadow of a doubt. I’ve downloaded a VPN. What do I do next? After registering and signing up for one of the VPN services we’ve recommended in this article, it’s a simple matter of downloading the client software and installing it on your device (Windows, MacOS, Android, or iOS). Once that’s done, scroll through the list of available server locations until you come across options for the US. As mentioned before, each VPN in this list has a sizable number of said locations so this shouldn’t be a particularly cumbersome task. The ones higher up in the list should be the speedier ones so go for those if you can. Once the connection is successfully established, a green icon should show up in the taskbar. That means you’re now ready to browse the web anonymously and with a US IP address. Nearly as important as your IP address is the server your device uses to look up the IP addresses of different web pages and other online content. DNS, or Domain Name System, works sort of like a phone book in which names (domains) are matched with phone numbers (IP addresses). When attempting to unblock geo-locked content, many websites not only check where you’re calling from, but where the phone book is located. Even when you have an American IP address, if a DNS request is sent to a server outside of the US to look up an IP address, the website or app can see this and still block you. Therefore, it’s important that the DNS server you use is in the same country as your IP address. In this case, you need a DNS server inside the US. All of the VPNs in the above list have apps that take care of this for you. When you connect to the VPN server, your DNS requests are also sent through the encrypted tunnel. Good VPNs, like the ones we recommend, operate their own private DNS servers, so your DNS requests cannot be used to track which websites you visit by your ISP or another DNS server provider. You might need to toggle this option on in your VPN app’s settings. Some mediocre VPNs will send your DNS requests through the tunnel, but then use a public DNS service like Google DNS on the other side. This will let you use DNS servers in the US, but Google would be able to record which websites you visit and when, which is not ideal for privacy. Other VPNs fail to tunnel DNS requests altogether. If your VPN provider doesn’t tunnel DNS traffic for you, you can manually configure DNS servers on most devices. We recommend a service like OpenNIC, which offers free DNS servers in specific countries including the US. The exact process for changing DNS servers varies between devices, but you can usually add primary and secondary DNS servers somewhere in your network configuration settings. Windows 10 users in particular should be aware that their operating system often sends such requests in tandem, one over the IPv4 protocol and one over IPv6. Windows uses whichever one comes back faster, however, IPv6 requests are often sent outside the VPN tunnel. If your VPN doesn’t offer IPv6 leak protection, you may need to disable IPv6 altogether in your wifi settings. 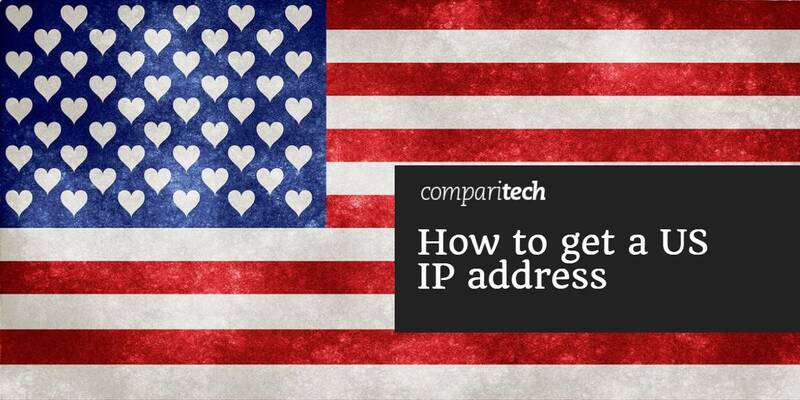 What are the other ways to get a US IP address? There’s the option of using the Tor browser. This is a free service available to everyone on the web and designed to provide encryption and anonymity. Many people including journalists, human rights activists, and whistleblowers use Tor to keep their identity hidden on the web. It is possible to acquire a US IP address with Tor, but the process is a bit complicated and requires multiple steps. This guide breaks it down in more detail. Having said that, speeds on the Tor browser are buggy at best so if you’re looking to download or stream HD video, this isn’t a suitable option. Best to go with a VPN instead. The last possible option is to use a free proxy server. But these work in a similar vein to free VPN services. There are download caps and unclear privacy policies. Be prepared to be booted out just halfway into your episode of House of Cards. HTTP and SOCKS proxies often aren’t encrypted, and they only route traffic from certain apps, such as your web browser. 2 Why get an American IP address? 3 What’s the best VPN to get a US IP address? 14 Should I use a free VPN? 16 I’ve downloaded a VPN. What do I do next? 18 What are the other ways to get a US IP address? 9 Should I use a free VPN? 11 I’ve downloaded a VPN. What do I do next? 13 What are the other ways to get a US IP address?